Day one of my Blogging experience. Wherein I shall share miscellaneous trivia and ramblings from my world. You may be wondering about the title, "A Year With Bigfoot and Bubba" ©. Simple. Bigfoot is the firat Leica M5 body that I purchased in 2006. I liked Bubba so much that when Sonny Carter offered his M5 for sale, I bought it. Coming from the South, and Bigfoot's younger sibling, Bubba seemed appropriate. 1. "You will want 35, 50 & 90." Advice offered by the one and only Leica rep. I have met and spoken to on the occasion of my first rangefinder camera purchase in Lafayette, LA circa 1967. 2. 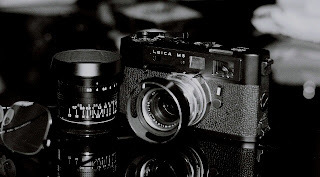 Mike Johnson's advice to spend a year with one Leica and one lens and black and white film. Over the last few years I have accumulated a motley assortment of expired and fresh B&W film. I have a couple hundred feet of bulk Ilford PanF+ and a few rolls of ancient Delta 100. Complimenting the Ilford films are 10 fresh rolls each of Arista Premium 100 & 400. Xtol and Rodinal are my developers of choice today. Ironically, I don't have Bigfoot, Bubba or the lenses with me today. A scheduling snafu left the cameras at home and me in Houston. No worries. I shall have everything in place on Friday the 3rd. Hopefully the coming year will open my eyes. Foster some changes perhaps. Find any skills I may posses. Go figure. It's like I joined the 21st Century.